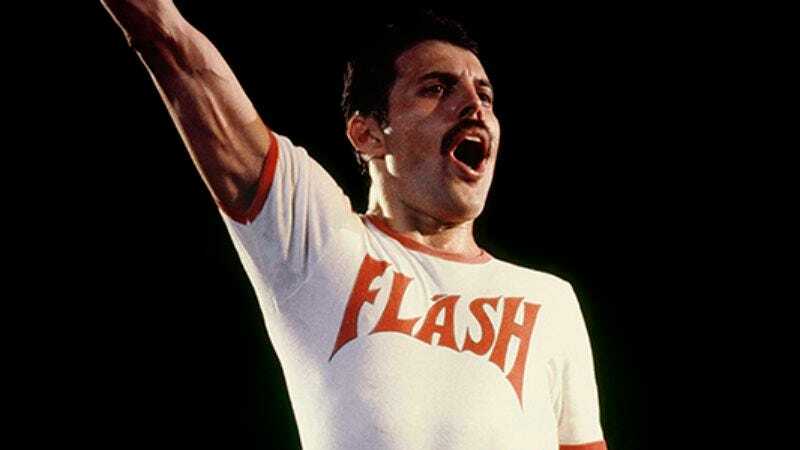 Late Queen frontman Freddie Mercury was known for his commanding live performances. But he became internet-iconic thanks in part to a stunt he pulled during shows in late 1979 and into 1980: emerging during the encore perched on the shoulders of someone dressed as Darth Vader or Superman. The former gesture has become far more well known than the latter, due to online-circulated photos of the stunt and the occasional meme. In fact, earlier this year, Rian Johnson, the writer and director Star Wars: Episode VIII, even tweeted a photo of Mercury and Vader to silence a troll. Most of these photos date from 1980’s The Game tour, a fact verified because Mercury is sporting a mustache, a look so controversial that fans reportedly threw razors at him. One photographer lucky enough to catch Mercury during that era was Tom Callins, who shot Queen on August 10, 1980, at Houston’s Summit Center—a basketball arena then, and now the headquarters of the megachurch Lakewood Church, whose pastor is televangelist Joel Osteen. At the time, he was 21 and working for a commercial photographer while attending college and shooting rock shows at night. Callins wasn’t expecting Mercury to arrive during the encore with Darth in tow, but he happened to be in the right place at the right time and captured a moment that’s been bootlegged online for years now. The photo Callins took is now being represented and sold by the Austin-based Modern Rocks Gallery, whose collection also includes rare Nirvana photos snapped by Kirk Weddle, who also took the Nevermind album cover shot, and unique photos of The Smiths, David Bowie, Rush, Van Halen, and Bruce Springsteen. (A Callins photo of Queen guitarist Brian May, taken at the same show, is also available.) As he explains to The A.V. Club, there are a lot of misconceptions floating around about these photos of Darth and Mercury. The only one Callins has ever released is the one pictured above; any other photos credited to him are incorrect. The black-and-white one Johnson tweeted? Not his. The snap posted to Reddit earlier this year that was purported to be from the Houston show? Not from that date and not his either, Callins says. Still, the photographer—who still lives in Houston and still shoots the occasional rock show—has fond memories of shooting the 1980 show and capturing an occasion that lives on in internet infamy, as he recently told us. The A.V. Club: Were you on assignment for somebody shooting Queen? Tom Callins: I was doing it for myself, [but] I did review that concert for a local magazine in San Antonio, Texas, called It’s Only Rock & Roll. I grew up in San Antonio and moved to Houston when I was a teen. Part of the reason I chose Houston is because of all the concerts. Generally, all of the big concerts would come to Houston and Dallas, and a lot of the bigger shows would bypass San Antonio. I wanted to be where the bigger concerts were happening. AVC: What were your restrictions? Was it first-three-songs-and-out from the pit like it is now? TC: It was a free-for-all back in the day. It was prior to the three-songs-and-out. If you had a pass, you were lucky enough to hang out in the pit for the concert, which I think was great. The first three songs, every performer comes out, and they have the persona they have on. They’re kind of like playing themselves. It isn’t until further in the set that they instinctively start doing their thing. That’s when I think the best shots are. AVC: The Darth Vader appearance happened in the encore, correct? TC: It was during the encore, and it was during “We Will Rock You.” And he came out sitting on Darth’s shoulders. I guess it was a shtick he did that tour, because I’ve seen other photos of other shows. But I just happened to be at the right angle at the right place in front of the stage to get the shot. AVC: What was your reaction when you saw this happening? TC: I tried to focus as quick as I could. They were walking toward me, and I was concerned because I had a fixed-focal lens, which was a 135mm Canon f/2.8 lens. That was my main concert lens at the time, and because it was a fixed focal, I couldn’t zoom in or out, and they were walking toward me. I didn’t want them to get too close, because I’d miss all the action. I remember focusing and thinking to myself, “Please, stop—stop, stop!” [Laughs.] He kind of did—I think he took one step too many for me, but that’s where he stopped, and that’s when I got the picture. AVC: About how far away from them were you? TC: Not very far. I was right at the foot of the stage, and they were probably in the center of the stage. It was about maybe 20 feet away? Fifteen feet away? AVC: Who was Darth? Was it a roadie? Did you know who was in the suit? TC: I never found out—I’ve never known. I’m sure it was a roadie that they hired, or maybe a bodyguard. I guess you had to be a pretty bulky guy to carry Freddie around. AVC: What was the crowd reaction when this happened? TC: Oh, it was pandemonium. Everybody just thought it was so funny, so Freddie. It was so over-the-top. [Laughs.] Everybody got a chuckle out of it, but a cheer went up. It was a happening, you know? Everybody got into it. AVC: During that whole era, Star Wars fandom and mania was at a fever pitch. TC: And Queen had done the soundtrack to [1980 film] Flash Gordon, so there was the whole sci-fi connection. AVC: Were you a Queen fan when you shot the show? TC: Oh yeah. I was in junior high when I first heard Queen II, and shortly thereafter, Sheer Heart Attack was released—[that’s] still that’s my favorite Queen record. I backtracked to the first Queen [single] “Keep Yourself Alive.” So I had been a Queen fan for at least five or six years. In fact, in San Antonio, I saw Queen in 1975. I was fifteen years old, and it was at Municipal Auditorium in San Antonio, which was a great rock ’n’ roll venue, it wasn’t really a big auditorium at all. But then Queen came on—the stage got dark, and they’re playing the pre-recorded tracks from the opening of Queen II, “Procession.” They started with Brian playing that guitar part [to “Now I’m Here”]. Everybody rushed the stage. I still get goose bumps thinking about it. It was so exciting. I thought to myself, “Man, I wish I had a camera.” That’s how the thought got in my head that maybe I should start taking a camera to concerts. AVC: When you finally did get to shoot them in 1980, were there any particular challenges? What was the best part? TC: It was really a good show. The lighting was really great for photography. I photographed them in 1982, a couple years later. The lighting was more elaborate and probably from an audience perspective it was more grandiose. [But] the images don’t have the certain look that the 1980 concert had. I feel I was fortunate, because the pictures look so great. [It was like] somebody had styled the lighting for me. It was just great facing Queen and having Queen in my viewfinder, because I was a huge Queen fan. I particularly like Brian May’s guitar: Nobody has tone like Brian May’s, it’s amazing. AVC: You weren’t even supposed to be there to get the Freddie-Darth shot! TC: It was looser back in the day—I generally got in front, whether I had a photo pass or not. I could generally get to where I wanted to be. It wasn’t a big a deal as it is now. AVC: What did you do with all the pictures you took? TC: The San Antonio music magazine was one of those regional giveaway magazines, music magazines, you’d find in record stores. They ran the story; I reviewed the concert, and they ran a couple of pictures in that. For the ’82 show, I was talking to the record company trying to get a photo pass. It got down to the day of the show—the week of the show—and the girl I had been talking to said, “I’m sorry, they’re not issuing photo passes.” I said, “Well, I’ve got this great picture of Brian May I’d like to get to him. Do you know how I could do it?” She goes, “If you want to send it to me, they’ll be in our Los Angeles office on this tour, we have a meeting with them.” So I sent her two copies—one for Brian, one for me. Brian signed it and sent it back to me. I have that hanging on my wall. Outside of that, they’ve been in my archive. Maybe about 15 years ago, there’s an agency in New York that has some of my archives. Occasionally, the Freddie Mercury [photo] will sell online, and I’ll get a nominal check every once in a while, because it’ll be [due to] some internet usage. But since the internet came around, it’s just been bootlegged all over the world. AVC: Was the photo in the San Antonio review? Did the photo get out somewhere else? I did have that photo on my web gallery—I’m a commercial photographer now, I shoot a lot of corporate work here in Houston, corporate industrial. I still shoot music for fun. So I did have it on my web gallery. People just bootlegged it, and it got around. AVC: That is the perils of the internet: They find it and think it’s fair game. TC: I don’t let it bother me, because it’s an internet-sized image—I can’t see anybody doing anything with it of any significance outside of sharing it on the internet. AVC: What other bands have you shot that you’re particularly proud of? TC: I shot The Who at the Summit. That was the year [Pete] Townshend had a broken wrist or something, he had a cast on the strumming hand. I’m a huge Mott The Hoople fan, and I photographed Ian Hunter in 1979 when he was with Mick Ronson. Got really great shots of Ian Hunter I’m really proud of—I’m as proud of that shot as I am of the Brian May shot and the Freddie shot. I shot The New Barbarians with Keith [Richards] and Ronnie [Wood], when Ronnie put together The New Barbarians tour. That was a lot of fun. [Bruce] Springsteen—I’ve seen him three or four times, photographed him one show. It was just an amazing event to photograph; there was so much energy onstage. It translates into pictures. There was a certain era from 1978, ’79 to ’83, ’84, where I was shooting a lot of concerts. TC: I’m very proud of [the Freddie-Darth photo], I’ll tell you that. It was a fun time in my life, and I still enjoy shooting music. The older I get, the more I miss Freddie—the more I realize how one-of-a-kind person he was, what a force he was vocally. Nobody can take his place, you know?